The Loog Backpack keeps your Loog safe and warm when you are on the go, whether it's to a friend's house or touring the world (hey, there are some very cool Loog players out there). This revolutionary kids acoustic guitar is designed to make learning the guitar an easy process for young kids or learners. The original Acoustic Loog guitar comes with only 3 strings, which means younger learners don’t have to grip a full width neck. This makes constructing chords much easier for smaller hands and the overall process of learning the guitar a less daunting experience for the child or new learner. As a result, kids progress quicker and don’t get frustrated and loose interest. All Loog guitars come with a self teaching app that will have them playing along with their favourite artist and songs in no time. The guitars are made of quality components and woods, that give the guitar a clean tone and a easy to play full scale neck. All Loog Guitars come un-assembled, as we believe that building your own guitar is an experience that helps you bond with the instrument in a deeper level. It is also a bonding experience between parents and their children, who can build their Loog together and share their love of music. A kids acoustic guitar will help in a childs development and help them gain skills that will help them in all aspects of life. The Loog starter pack has eveything that you need to get your kids learning and being passionate about music. 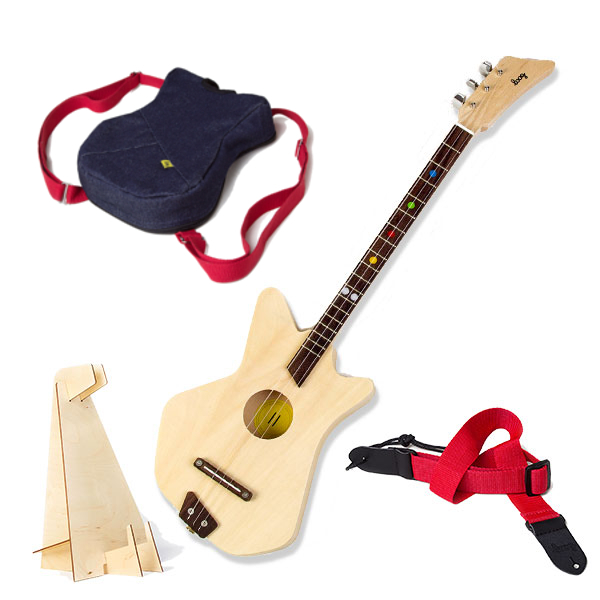 The Loog starter kit comes with the acoustic Loog, a Loog backpack, strap and stand for ease of use and storage.